New proposals being drafted would that mean a person’s organs would automatically be donated unless they specifically requested to opt out of the system. MINISTER FOR HEALTH Dr James Reilly is planning to bring forward legislative proposals to tackle the problem of fewer organs for transplantation being available due to falling donor numbers. The current ‘opt-in’ system gives people the opportunity to volunteer their organs through the use of a donor card, or for their families to grant permission following their death. However, the new ‘opt-out’ proposals would mean that a person’s organs would automatically be harvested unless they specifically requested them not to be, IrishHealth.com reports. Responding to Dáil questions last week, Reilly said that the department was “working to finalise the proposals” and that he was “considering what practices and organisational changes could further improve donation rates in this country”. The proposals would be included in a Human Tissue Bill, which will also include the recommendations of the Madden report concerning post-mortem practices. The Irish Independent reports that the lack of donors has led to bleak prospects for hundreds of people in desperate need of transplants. Last year, several of the country’s hospitals had just one donor for an entire year: Cork University Hospital, the Mater Hospital, Tallaght Hospital and St Vincent’s Hospital all had a single donor whose organs could be harvested to help a gravely ill person. Mark Murphy, chief executive of the Irish Kidney Association said they suspected that staffing shortages in hospitals meant that fewer medical experts were available to competently and sensitively talk to patients, or their grieving families, about the value that organ donation has for those who could not survive without a transplant. Organ Donor Awareness Week will take place from 2 – 9 April. 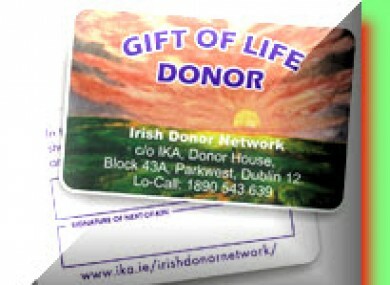 Email “Minister for Health to propose new 'opt-out' system for organ donation”. Feedback on “Minister for Health to propose new 'opt-out' system for organ donation”.